We’re at Part 9 already?! Where does the time go? If you’ve missed the last few internship posts, why not get caught up and check them out now? So the placement I just finished (and by just, well, I mean a little while ago) was a quick one week placement, but one I had been looking forward to since the beginning of internship. You see, my last placement was one of my 2 elective weeks. A placement in the area of my choosing – which meant I could find something outside of all the clinical and food service we have to do during internship (if you add up all of the time in internship, approximately 1/2 is spent in clinical, and 1/4 is spent in food service). I’m not putting down the importance of clinical placements – I just also know there are so many other areas that RD’s can work in, such as with grocery stores, food companies, private practice, etc. I really wanted to get some exposure to these “less traditional” areas, and knew that elective time was where I was going to do it. All that being said, finding a placement that would give me this exposure turned out to be more difficult than I thought it would. I originally wanted to do spend a week with a grocery store RD, but I was turned down due to my place of my employment. I then started contacting various private practice RD’s, had some more “rejection emails”, but ended up finding my placement with the help of my site internship coordinator. I was happy to set up a week of activities with Colleen McGuire from At The Table Nutrition. Turns out I’m the first intern Colleen has taken for an elective placement before (I feel special! ), and I would say it was a great experience for both of us. I appreciated the variety of activities we did throughout the week, and the discussions we had around private practice, nutrition, internship, and food in general. We have similar attitudes towards food and nutrition. And although we had already met before this (once in a class at UBC where Colleen presented), we discovered that I actually taught her daughter learn to skate lessons when I was a teenager. Small world, eh? One of the most interesting things of the whole week was during one of the outpatient counselling sessions, where we saw a family who’s children have a very rare condition called Erythropoietic Protoporphyria, or EPP for short. What does that mean medically speaking? They have adverse skin reactions to UV light, and therefore need to cover up or remain inside all of the time. Definitely wasn’t something we were expecting to see, but it turned out to be a fascinating learning experience for both of us. I think getting to spend some time with a private practice RD was so beneficial to my internship experience, and I actually think every should try and seek out the opportunity. As students we just don’t get enough exposure to this aspect of our profession, and if it’s something you might even be remotely interested in, internship is the time to explore it. Why not have the broadest range of experience before you actually have to start deciding on what jobs you want to take? 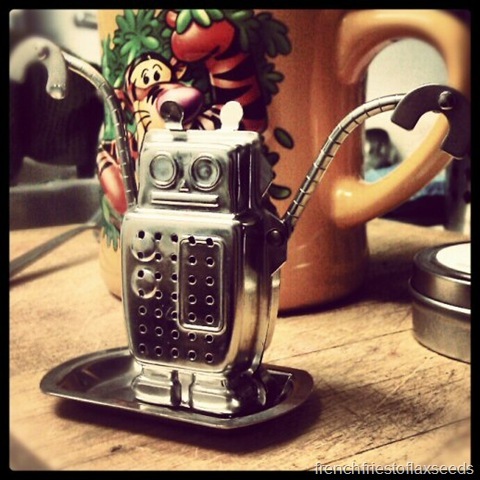 Robot tea steeper – it makes tea time that much more fun! That sounds like an awesome experience. With all the possible career choices, internship could last a whole year! I definitely wish there had been more non-clinical placements. Where is your other elective week going to be?